The tenth edition of ‘Chobi Mela’, one of the biggest photography festivals of Asia, jointly organized by Drik Picture Library Ltd. and Pathshala South Asian Media Institute, was inaugurated on February 28 at Chhayanaut Auditorium. The Drik-Pathshala under construction building in Panthapath is the main venue of the fest. With ‘Place’ as its theme, the festival is also going on at Drik Gallery in Dhanmondi and Panthapath, Goethe Institut, Gyantapas Abdur Razzak Bidyapeeth, Britto Arts Trust and Alliance Française de Dhaka. 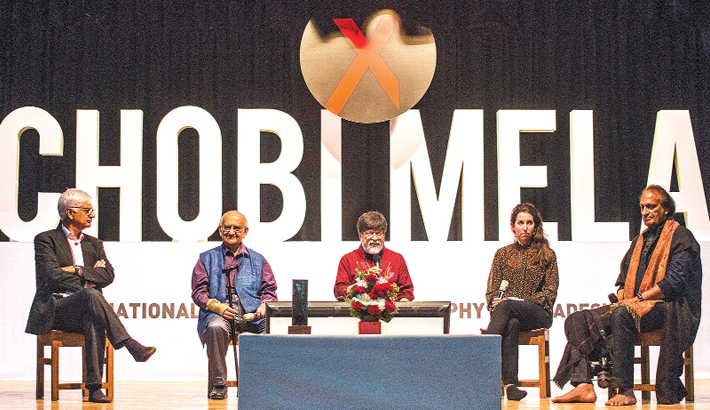 The inaugural ceremony was presided over by Shahidul Alam, the festival director, while curator of USA’s Rubin Museum of Art Beth Citron, Nepali publisher, writer and editor Kunda Dixit, Indian photographer Raghu Rai, and economist Rehman Sobhan were present at the event as special guests. The festival is curated by ASM Rezaur Rahman, Munem Wasif, Sarker Protick and Tanzim Wahab along with the guest curators. Internationally renowned photographer, agricultural scientist and author late Dr. Nawajesh Ahmed was awarded with ‘The Lifetime Achievement Award 2019’ for his outstanding contribution to the photography arena of Bangladesh. This year ‘Chobi Mela’ is featuring a total of 33 exhibitions with works of 44 artists from 21 countries including ‘Nicaragua in Time’ by the American documentary photographer Susan Meiselas, based on the Nicaraguan revolution of the late 1970s. Among all the exhibitions art works of ‘Archives of Persistence’, ‘the Kashmir Photo Collective’, ‘the Jag Chobi Collection’ and ‘the Burj al-Shamali Collection’ have come up from the places of conflicts and transition which have put emphasis on the production, compilation, reminiscence, physical existence and social responsibility of archives in global context. Another key exhibition titled ‘Rashid Talukder (1939-2011): A Life’s Work’, based on the works by late Rashid Talukder, one of the legendary photojournalists of Bangladesh, is a special feature of the festival. The exhibition portrays a priceless visual documentation of Bangladesh’s history of independence, starting from the early 1950’s Language Movement to 1971’s Liberation War and many other images of ordinary lives. The festival is also promoting 13 Bangladeshi artists as ‘Chobi Mela Fellows’ to produce site-specific artworks. To scrutinize the theme ‘Place’, these artists from different backgrounds including painting, drawing, architecture, sculpture, photography, video, sound and installations are expanding the possibilities of medium and testing the language of manifestations. These projects are nurtured with dialogues and guidance from the guest curator Zihan Karim. ‘Artist Talk’ is another special event of this fest where eminent writer Arundhati Roy, renowned German publisher and bookmaker Gerhard Steidl, celebrated Indian singer, lyricist and music researcher Moushumi Bhowmik, pioneering Indian photographer and photojournalist Raghu Rai and others are taking part. The festival also includes 8 workshops conducted by prominent photo practitioners from different parts of the world. These workshops cover a variety of topics from photography, photo-book and documentary films to trans-media visual narratives. Film screening is also going on at Alliance Française de Dhaka auditorium as a part of the fest. It is mentionable here that ‘Chobi Mela’ is one of the most prestigious photography fests in Asia. This edition will come to an end on March 9.